For additional information and guidance, see EPA's publication: RCRA in Focus – Photo Processing. Waste developer should not be mixed with fixer, otherwise, the combined solution will most likely be a hazardous waste. Unfortunately, some development units mix the fixer and developer after they are spent, making the entire solution hazardous waste. in such cases, consider changing or modifying your equipment (you may be able to purchase an adapter kit to keep the fixer and developer separate). Many cleaners for X-ray developer systems contain chromium (or "chromate") and are hazardous waste (D007) when discarded. Also, some developer system cleaners meet the definition of corrosiveness or reactivity (contain oxidizing chemicals) and may need to be handled as hazardous waste when spent. The onus for such determinations is on the generator of the waste, so be certain to fully investigate these materials. One source of information is the Material Safety Data Sheet (MSDS). Although MSDSs contain sparse information with regard to RCRA, you can at least determine if the product contains chromium. Many dental offices are now avoiding the hassles and costs associated with used photographic fixer and associated wastes by installing digital imaging (dental radiographs) equipment. Digital imaging is a dry system; no liquid chemicals are used in taking and developing the image. Because digital imaging uses a laser and computer system, no waste is produced from the imaging process. Ultimately waste will include outdated electronics, video cards and possibly paper images, if they are printed. The American Dental Association website has various resources that describe this process. 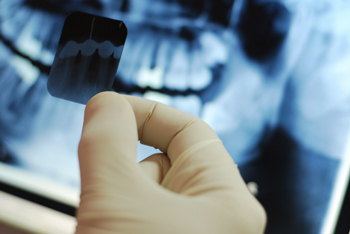 For starters, see Digital radiographs Imaging technology for the dental office. ADA also sponsors workshops covering this topic.